You might be surprised to learn our view on participation trophies. 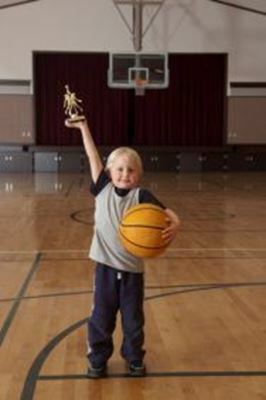 Unlike some of our competitors, we don’t believe “everyone is a winner!” We do, however, believe that, for many reasons, recognition is important even in youth sports. That said, there are a couple of distinct schools of thought regarding participation trophies, and how they purportedly have “ruined” a generation of young people . . . Millennials, to be precise. The other side of the argument is that nobody should get a trophy until they actually deserve one for being a winner. There is no question James Harrison is a champion, works hard, and has won great recognition, including three elite titles. While Harrison is correct, he should make sure his boys know he is very proud of them. Is it possible telling them their best is not good enough sends a message that only perfection is acceptable? And, is he asking his boys to be perfect in a world where perfection, if it does exist, is fleeting? I have to give Mr. Harrison some kudos, because, unlike many professional athletes, he cares about winning above the big paycheck -- and he proved that by accepting less pay to help the Patriots win a Super Bowl in 2017. A few thoughts on participation trophies. . . I need to be clear: Newline Trophyand Engravinghas not been built on the sale of participation trophies, but, rather, on the creation of fine custom awards and trophies for corporate recognition. However, we do believe there is a happy medium between the two schools of thought. I assure you, children and adults know the difference between championship trophies and those given for participation. There are many leagues whose foundational beliefs are centered around every child receiving a trophy at season’s end. As a parent, you should decide what is best for your family, and then make a choice. An AYSO trophy is something many kids hold on to and cherish for the rest of their lives, as tokens of a wonderful time spent playing soccer. On the other hand, many parents feel that participation trophies send the wrong message to their kids and give them a false sense of achievement. Regardless of your view on the role of trophies, understand that just because every child gets a trophy, it doesn’t mean there shouldn’t be a meaning and a message attached. We believe there is value when a coach takes a few minutes at the end of a season to lift a child up, pat him on the back and tell the story of how they improved, while presenting a certificate, pin, trophy or medallion. And we don’t believe that recognition in front of his peers will ruin, make him soft or misguided in this world. Trust (me), there are plenty of other worldly issues more pressing than a participation trophy to distract your child. Is there room when our children are recognized at the end of a season to allow them to accept a trophy as an achievement, because the league we signed our kids up in chooses to present a certificate, pin or trophy? Could we be sending a negative message to our children by giving the trophy back and telling them they are not worthy until they earn a “real” trophy? Clearly a tough subject that requires some thought. One where as parents we need to make decisions that are best for our families. Trophy or not, youth sports offer a significant opportunity for us as parents to connect with our kids and communities. Parents, I urge you to participate in your children’s lives; put your cellphones down; go to practices; if possible, help the coach; cheer your child on; meet other families; develop a community around your family that cares for your child (and you, theirs), and use the time driving to practice and games to get to know your children and their friends. Because it is not the “participation trophy” that motivates your children; it’s the fact that they know they are valued and loved. Remember, the trophy may not have longterm importance, but the relationship lasts a lifetime!